Any Way to Convert Spotify Music to MP3? Get It Here! Convert Spotify music to MP3? 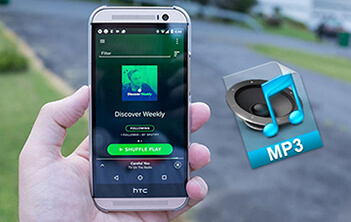 This article covers the best effective way to convert Spotify songs to MP3 for playing tracks on MP3 player. If you would like to import Spotify music to iTunes library, you can follow this tutorial to do it with a few clicks. Do you want to play Spotify on Amazon Fire TV? If so, you can follow these tips to install and set up Spotify. In addition, you can download Spotify songs offline by DRmare software so that you can enjoy Spotify Music on Fire TV for free. Spotify is also a great source for free audiobooks. If you'd like to listen to Spotify audiobooks offline, you can follow this tutorial to search and download audiobooks from Spotify app. Many countries don't allow DRM cracking. If you still want to get Spotify music offline, you can try these top 2 ways to record songs from Spotify legally. 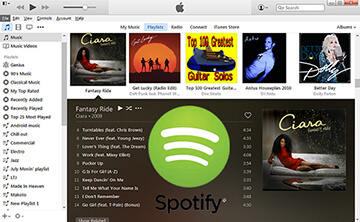 Spotify had released the collaborative feature since 2008. It is great for making an ultimate playlist together with your friends. If you are not sure how to do that, you can find the details here. Apple HomePod is mainly designed for Apple Music, iTunes songs and so on. But don't worry, you can still play Spotify songs with AirPlay or you can upload your Spotify music to iCloud Music Library. Can't edit songs on Spotify anymore? No worries. You can still follow these tips to edit Spotify playlists directly or remove DRM to edit Spotify song on any audio converters. Do you have some favorite Spotify playlists which you have spent much time to curate? If so, you should definitely follow these ways to backup up so that to avoid missing them in the future. This review article introduces top 6 best Spotify Visualizer in 2019. It will bring you cool music visual effect and fun-filled experience when listening to the tunes from Spotify online. Spotify has the best support for Garmin fitness watches. If you'd enjoy listening to music while running, you can follow these tips to find out the best ways to get Spotify on Garmin. Want to ask Alexa to play Spotify songs, playlists for you? Normally, you have to get the Amazon Echo. With this tips, you can do that with third-party Alexa-enabled devices directly. Camtasia is a great tool for creating video tutorials. If you'd like to add music to Camtasia, you can simply follow this tips. If you enjoy dancing, you should definitely take a look at this top 10 list of Spotify EDM playlists. They contain the top EDM songs you will really love. Want to listen to both music and podcasts? No worries, just let Spotify to help you. It is also a great platform for finding free podcast. Check this page to find the top 10 list. Embedding Spotify playlists on websites is another best way to share music. Fans can simply click the Spotify play button to enjoy the songs directly. Check this page to find out the top 2 ways. Due to the DRM protection, Spotify premium only allows to stream music on one device at a time. If you'd like to play Spotify on multiple devices, you can follow this page to find the top 5 best ways. Want to enjoy Spotify songs on Huawei P20 music player without premium membership? It has never been easier. Just follow this tips to use the DRmare Spotify Music Converter to download the playlists offline. Spotify has been testing the lossless version music since 2017, but still haven't released it yet. If you are hurry to get the lossless streaming, you can follow this tips to reset Spotify bitrate. Serato DJ is the most popular DJ software in the market. Unfortunately it doesn't support to play Spotify music. Here you can find the best alternative solution to import Spotify music to Serato DJ. Are you going to have a DJ party? If so, you can consider to DJ Spotify music and here are the top 3 ways for your reference.